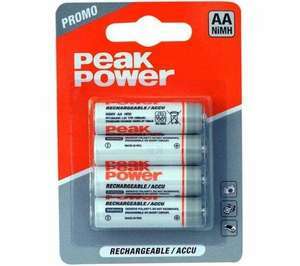 4 x 1300 mAh AA batteries in Home Bargains for only 99p.quality seems alright,does the job for kids wii controllers. i love a bargain, but what ive learnt with batteries and most things in life is that you pay for what you get. If you pay 99p for four rechargables, your going to find they really are 99p's worth and not such a bargain after all. i love a bargain, but what ive learnt with batteries and most things in … i love a bargain, but what ive learnt with batteries and most things in life is that you pay for what you get. If you pay 99p for four rechargables, your going to find they really are 99p's worth and not such a bargain after all. i bought these last week, after being on charge for about 18hrs they still didnt work!